It was so hot - nearly 100 F and killing humid - even Vietnamese complained. By evening it cooled a little. Throngs gathered before the colonial City Opera to listen to bands and watch an Ao Dai fashion show. The Ao Dai is Vietnam's traditional garment for women. The Opera, completely restored, is breathtaking. At far left is the Givral coffee house. During the war waiters in boiled white shirts served up ice cream, Vietnam's excellent coffee, and intrigue. The menu is the same today. The Continental Hotel is bathed in yellow light. At right is the five-star Caravelle Hotel. The original 10 story building remains, but a 20 story-plus addition was built after the war. 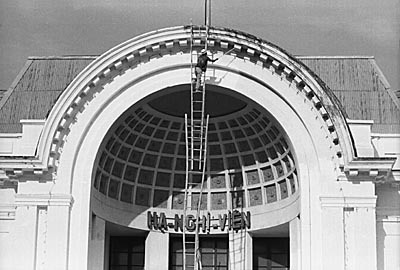 Below, about 1973 the Opera, then used for South Vietnam's National Assembly meetings, is cleaned by a worker clinging to rickety ladders.